Yesterday was spent finally getting to grips with the remaining detritus of Christmas. Or namely the business of cleaning the house for the first time proper since, ooh about December 19th. There was no point in trying to tidy, sweep or shift anything from that point onwards really. Because as soon as we tried, that space would soon be swiftly occupied by some sort of matter. Sometimes organic, usually plastic, stuck upwards at vicious angles and ready to pierce the soft under-skin of my sweet bare feet. Yes, my children really are untidy little shits and over the holiday period they seemed to veer from room to room like two small dusty tornadoes, spewing up and ejecting furniture all over the place. The best I could do was to follow them slowly around the place and observe; whilst gently weeping into my mug of tea and wondering where the hell had I put my slippers. Thankfully, they are back at school now and so I started on sweeping up the vast amount of paper that had accumulated in all corners. White sheets bent into shapes, full of pictures drawn in vivid colour, with words scrawled, frenetically; stories that desperately needed to come out. I love that they like to write and I will never stop encouraging them but the editing is a pain in the bum. By editing, I mean deciding on what pages to keep and what pages to throw into the orange recycling sack. A method of recycling by the local council that still doesn't entirely convince me. Usually, as the momentum builds, I tend to become more and more indifferent to what I read. Wolverine has defeated some aliens, yet again. Mummy is the best Mummy in the world, yet again. And ffs, Daddy still has issues with flatulence going on (they really do like drawing pictures of me farting, for some reason). Blah, blah, blah. I have heard it all before and so on this occasion, I started swooping up everything wholesale. 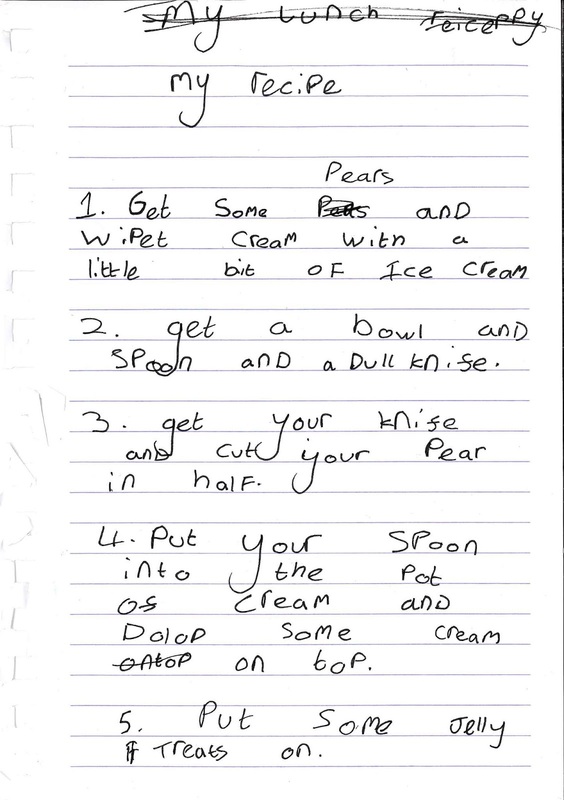 But then, luckily, I stumbled across this gem, a recipe written by my daughter and whilst I am aware that this is developing into another soppy blog post, I wanted to share it. Not just for the smiles I hope it will raise but as an antidote to all the January healthy eating horlicks that is going on out there. I for one think that wiping food with a little bit of ice-cream is a great idea. you should get Isla to make a video making this for your YouTube channel! You meanie - she's obviously saying "whipped cream". This is so sweet. I hope you make it for her. quick check the bin bag,your son wrote his out too ! Gin and Crumpets - We'll make it at the weekend! Nanny Jill - Oh bugger!